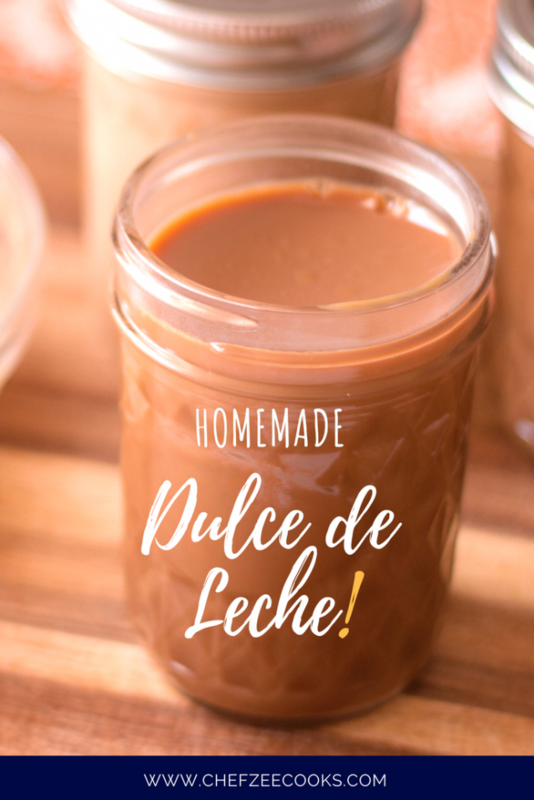 Dulce de Leche is a sinfully delicious dessert that you can eat right out of the jar! In fact, this dessert is also insanely easy to make at home and once I walk you through all of the steps, you’re going to be wondering why you’ve been over paying for this Hispanic Caramel delight! However, I do have to note that while Dulce de Leche is super easy to make, any mistake in making it will result in a disaster! ALWAYS make sure that you Dulce de Leche is fully submerged in water! ALWAYS cook your Dulce de Leche on a low heat setting! ALWAYS allow your Dulce de Leche to cool completely before opening or using! As I mentioned before, making Dulce de Leche is super easy. All you need is a can of sweet condensed milk! I recommend using a brand that you love since this will be the base of flavor of your Dulce de Leche. Now there are two main ways of making this treat. You can remove the labeling from the can of sweet condensed milk, place it in a deep pot, add water, and heat over low heat for 4 hours. The key to this, is to never allow the water to come to an actual boil and making sure that the can is ALWAYS fully submerged in water. You also want to make sure that your can is standing straight up and not on its side. Once the Dulce de Leche is done, you want to remove the can from the water and let it cool completely before opening. This is EXTREMELY important since pressure as built up in the can. Imagine the can in a mini pressure cooker. You never want to open a pressure cooker before the pressure has released. In this case, you don’t want to open the can until it has cooled completely. My suggestion, is that you wait 12-24 hours before opening the can. This way you make sure you’re entirely safe and you don’t end up with Dulce de Leche all over your kitchen cabinets. Now I personally prefer the even easier yet longer method of making Dulce de Leche. I like to first transfer the sweet condensed milk into 8oz Half Pint Mason Jars. I make sure to close the lid super super tight, which is pretty easy to do when working with mason jars. Afterwards, I then place the mason jars into a slow cooker and add enough water until the mason jars are covered completely. I then slow cook them on a low heat setting for 8 hours. I usually make a few at a time and take a few out at the 6-7 hour mark. I love having Dulce de Leche that’s caramelized at different levels. The longer you slow cook it, the deeper the color and the richer the taste. When you cook it for 6-7 hours, you end up with a Dulce de Leche that’s lighter and slightly runnier. It’s a great sauce and perfect for drizzling over cakes and ice cream! The other great thing about using mason jars is that you can also eyeball just how rich and deep your Dulce de Leche is. Once the slow cooker has done its job and the 8 hours are up, remove and let it cool COMPLETELY before opening. 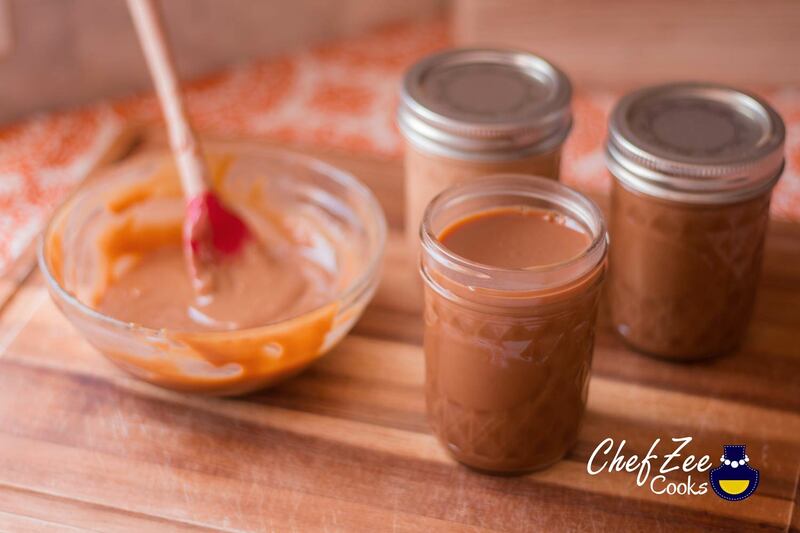 Just like the can, the same rules apply to Dulce de Leche that’s being made in a mason jar. In the end, feel free to enjoy your Dulce de Leche with your favorite sweets. You can even make Dulce de Leche Ice Cream or fill a cake with this awesome treat! Questions? Feel free to watch this step-by-step video on How to Make Dulce de Leche on my YouTube Channel: Chef Zee Cooks! Store in cabinets and use when ready! You can enjoy Dulce de Leche a variety of different ways. If you want Dulce de Leche that's less caramelized and lighter in color, feel free to cook for 6 hours instead of 8.